At the outset we would like to state clearly that the Draft MSW Rules, 2013 threaten to retract the nation from the gains made by progressive states such as Maharashtra and Karnataka through progressive waste management policies such as the Maharashtra (Non-Biodegradable) Garbage Control Act, 2006 and the Karnataka Municipal Corporation (Amendment) Act, 2013, which promote decentralized waste management, segregated management and handling of organic and inorganic waste and inclusion of waste pickers. The rules are also completely in disharmony with existing progressive laws such as the Plastic Waste (Management and Handling) Rules, 2011, which are solidly founded on the principles of ‘polluter pays’, ‘extended producer responsibility’, inclusion of informal waste workers, and promotion of Reduction, Reuse and Recycling. Rag Pickers are the backbone of a neat and beautiful metropolis. The green workers manage entire trash of urban locates around the globe. However, their contribution to the city’s waste management remains unrecognized. Vulnerability is exacerbated by the municipal solid waste management rules 2013. Tough the new rules claim inclusion of rag pickers, they do not offer any safeguards, and rather endanger livelihoods of over 3.2 Million ragpickers. 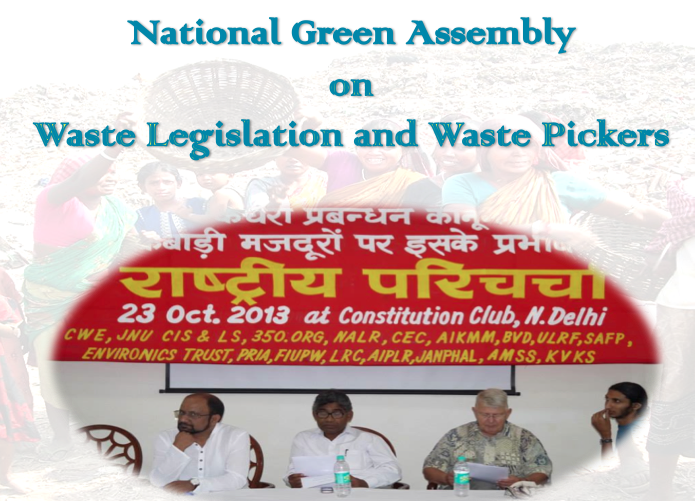 In this context a national green assembly on waste management and waste pickers was organised at the Deputy Speaker’s Hall, Constitution Club on October 23, 2013. The meeting was organised by All India Kabari Mazdoor Mahasangh. Organisation including National Alliance of Labour Rights (NALR), Centre for Informal Sector and Labour Studies (CIS&LS-JNU), Centre for Workers Education(CWE), PATH, Forum of Informal Urban Poor Worker, Centre for Education and Communication(CEC), Environic Trust, Participatory Research in Asia(PRIA ), 350.org, Labour Resource Centre(LRC), Janpahal, Sathi All for Partnership(SAFP), Asangathit Shramik Mahila Sangathan, Kachra Bechak Kashtakari Sabha, Safai Mazdoor Ekta Manch, Bal Vikas Dhara and All India Platform For Labour Rights. Waste pickers and their organizations from Maharashtra, Madhya Pradesh, Jharkhand, Uttar Pradesh, Himachal Pradesh, Harayana and Delhi were present. Addressing the gathering, Shashi B. Pandit, General Secretary of All India Kabari Mazdoor Mahasangh, appealed to all those present to prepare for a struggle against mal intention of capitalists in Green Legislation on Garbage Management and Impact of Garbage Management Legislation of 2013 on Waste Pickers. The Ministry of Environment and Forests, Government of India, has recently come out with the Draft of “Municipal Solid Waste (Management and Handling) Rules, 2013 (MSW Rules)”. These rules would replace previous MSW Rule of 2000 and have huge insinuation on the way waste is managed in cities across India. It is important to draw attention to the fact that these rules completely lack focus on the lives and livelihoods of millions of workers, both formal and informal, who have been involved in waste management for decades. It also unclear whether they will be able to address the problems of pollution control. Millions of workers are informally involved in collecting, sorting, recycling and selling waste material that someone else has thrown away by declaring it as garbage. Vital actors in the economy, these workers work hard to reduce carbon emission and save energy spent in handling the waste. They also contribute towards saving public money and provide widespread discernible and indiscernible benefit to our society, municipalities and the environment. Ironically however, they face harsh working conditions, often low social status, deplorable living conditions and no support from the government. Despite the fact that waste collectors recycle about 20 percent of the city’s waste saving the municipalities millions of rupees every year, they are not given any recognition in legislation, criminalized by the administration and ignored by society. They work without any direct payment, are not part of the public solid waste management systems, are socially invisible and seldom reported in official statistics. The 3R (reduce, reuse and recycle) is the most accepted universal recommendation to save the environment. These are the only workers who help our society be on track to follow these recommendations. Waste picking is responsive to the market for recyclables and is often a family enterprise. While it appears to be chaotic work, it is actually highly organized. In some cities, most waste pickers are migrants and rejected by the global economic processes. This puts them in a more vulnerable condition with no legal entitlements despite the fact that they are “The real, Invisible Environmentalists”. On one hand, waste pickers or the informal ‘waste managers’ remain invisible to policy makers. On the other hand, the problem of waste management continues to grow. In its 2009-10, Annual Report the Ministry of New and Renewable Energy (MNRE) estimated that approximately 55 million tons of MSW are generated in urban areas of India annually. It is estimated that the amount of waste generated in India will increase at a rate of approximately 1 – 1.33% annually. The problem will thus sustain and grow if adequate measures are not taken. While India claims of rapid economic development, the disparity between rich and poor is widening across the country‒ from large urban areas to small rural ones. According to ILO, despite playing such an important role for the society and environment, waste Pickers also fall under the 77% of the population who earn less than Rs. 20 every day because they are not authorized to collect the waste material from the source i.e. ; homes, factories, offices etc. Due to lack of recognition and authorization, waste pickers suffer from atrocities by Resident Welfare Associations, Policemen, Residents, Municipal Authority etc. With little scope of earning, they are entangled in the web of bribery. In spite of their significant role in protecting our environment and saving resources for the economy, the government has never noticed them as an important economic sector but merely mentioned their name (Waste Picker) in legislations and reports. Our overall comments are summarized as follows. 1. There are around 3.26 million informal waste workers in India who are involved in the process of collecting, sorting, sale and recycle of scrap items such as paper, plastic, glass, metals etc. 2. We recycle nearly 6.7 million tones of scrap every year. 3. We save Municipalities nearly 452 Million Rupees from reducing their cost of transporting garbage every year. 4. The reform of the waste management system, instead of supporting us in our efforts, has been displacing us from our occupation, and putting in place systems where the waste is collected and dumped or burnt outside city limits. 5. The Draft MSW Rules, 2013, do not mention the contribution of informal waste workers or suggest how they can be integrated into the process of a better, decentralized waste management system We therefore request you to stop wasting public money on incineration of precious resources – instead, support us in our century old effort to recycle waste near its point of generation. This will allow our policies and practices to be aligned with the Environment Protection Act, 1986, and the National Environmental Policy, 2006, which demand adherence to the policy of resource conservation and protection through practicing the principles of Reduction, Reuse and Recycling. 8) Registration and recognition of recycling enterprises such as scrap shops, wholesalers, dismantlers, recycling industries etc. 10) The local government should authorize waste pickers to collect user fee from beneficiaries of their services. The assembly begin with welcome address by Mr. Rajesh Upadhyay, Chair Person of National Alliance for Labors Rights. After welcome address, he produced a comprehensive picture of mission and vision of this alliance and gathering as well in perspective of Garbage Management Legislation of 2013. Inaugural Address was delivered by Prof. Jan Breman, Professor Emeritus, University of Amsterdam. Prof Breman stressed that informal sector work force are being pulled out of the cities. He quoted the example of Street Vendors has been pulled out of main Ahmadabad city and pointed that this displacement can keep us away from achieving target of clean cities. He shared that the living conditions around the Ganeshnagar Garbage Dump – the largest dump in the state were deplorable. With no shelter and no livelihoods left to them, the poor were left with no option but to pick waste and sell it to earn their bread. These workers, he said, were actually in a worst situation than the garbage they picked for ‘for even the garbage can get recycled, but those poor informal workers had no hope of their lives getting ‘recycled’ or made better’. This, he said, was the ‘Gujarat Model of Development’, widely touted about as the model to be followed by the rest of the nation. From his experience in the slums in Mumbai, Dr. Pradeep Shinde, Assistant Professor at JNU, Delhi, spoke about how contractualisation led to poor incomes and poor municipal services such as waste management as contractors tried to cut costs through unfair means. However, this led to exploitation of workers, who would have to turn to sale of valuable waste items to supplement their incomes, thereby coming into conflict with the interests of waste pickers. If the situation of informal workers and the provision of municipal services had to be improved, the phenomenon of contractualisation had to be tackled head on, he said. Mr. Onkar Sharma, Regional Labour Commissioner, added that the problem of protecting the rights of informal waste workers could be protected by forming a board for the purpose at the central and state level which would ensure that not only were their economic and political rights protected, but they were also recognised and provided access to social security. Ms. Pallavi Mansingh of the Centre for Education and Communication placed the issues of rag pickers in the larger context of informalisation and stressed on their right to social security. Speaking on the occasion Dr. Shreedhar Ramamurthy pointed that there had been a general decline in values in governance which needed to be tackled. The new mantra of governance, including governance of waste, was that of doing only those things through which money could be made. The Draft MSW Rules, 2013 reflected this philosophy as it only seemed to promote the interests of private companies and rent seeking government employees who would contract out services to them, rather than serving the environment or people. Mr. Ravi Agarwal, Founder Director of Toxics Link, was also of the view that it was foolish to think that policy making was being done for public interest any more. Instead, the Environment Protection Act, 1986, was used only to create policies which would help governments earn rent. Again, the Draft MSW Rules, 2013, were a perfect example of this trend as the rules seemed to be tailor made for Central, State and Municipal governments which would earn large amounts of money by contracting out waste management to large corporations. The rules only promoted waste to energy technologies as the solution for waste management whereas there was absolutely no basis to believe that the technology was most apt for waste processing in India. On the contrary, the technology requires an excellent pre-existing system of regulation to ensure compliance with environmental and health standards. He argued that the technology is not suitable for India where most of the waste is organic waste which cannot be used to produce energy. He stated that National Green Tribunal in a case found companies in the sector uses mechanism, which creates 200 % more pollution than the permitted limit. Mr. Anjor Bhaskar showed in his presentation that the organic waste actually required an input of nearly 4500 kwh/ton of energy to burn whereas it released negligible amounts of energy. Similarly he showed that one actually saved a lot of energy by recycling of waste – savings which were much higher than the energy produced from its incineration. He further showed that waste to energy plants in India were bound to fail as they required source segregated waste. The rules which promoted waste to energy plants, however, made no mention of how to achieve segregation, making it certain that all investments into waste to energy would go down the drain. If plants did operate however, by incinerating unsegregated waste they would lead to massive amounts of poisonous emissions, as was the case with the Timarpur Okhla Waste to Energy Plant. The plant was recently nearly shut down by the NGT for the massive amounts of emissions from it. He showed that the best way to manage waste was to ensure organic waste was collected separately and recycled within the same premises whereas dry or inorganic waste should be separately collected by waste pickers directly from their households. Having learnt from their experiences, several state governments such as Karnataka, Maharashtra and Kerala had prepared policies keeping this in mind. However, the central Rules reflected none of these learnings and continue to promote hugely expensive and unsustainable practices. additional employment for nearly 4.9 lakh workers who earn Rs. 10,000 per month from a clean and decent livelihood, and lead to savings of nearly 271.1 crores for Municipalities from reduced transport requirements (as waste would no longer be required to be transported to far off landfills or waste to energy plants). Mr. Anil Verma, Secretary AICCTU and Dr Laxman Mane, Kachara Bechak Kashtkari sabha, Maharashtra pronounced that the condition of waste pickers and other laborers of informal sector compels us to prepare ourselves for a fight against corruption and mal intention of Capitalists and highlighted the issues like informalization, flexibilization and discrimination.